(June 17): An Umno supreme council member has defended the right of the prime minister's brother, Datuk Seri Nazir Razak, to join politics and possibly go up against Datuk Seri Najib Razak, saying that siblings in rival parties was not a new phenomenon in Malaysian politics. Kepala Batas MP Datuk Seri Reezal Merican Naina Merican said that while some people may view it as Nazir challenging his own brother, he viewed it as democracy being practiced in an increasingly mature way. "Of course, in an obvious way, if you form a new party, of course you will be seen in that way. I will see it from a different perspective altogether. If we really uphold the spirit of democracy, everybody has got the right. "In parliament here we have (Tan Sri) Shahrir Samad and he has his brother (Khalid Samad) right in front of him," Reezal told reporters in the Parliament lobby, in reference to the Barisan Nasional Backbenchers Club chairman and a PAS MP. "They went to the same school, they went through the same upbringing, but they took different paths and became the leaders of their respective parties. So I think it's perfectly fine." Reezal added that former Umno supreme council member Tan Sri Abdul Kadir Sheikh Fadzir had also set up a new non-partisan party recently, despite his brothers holding Umno division chief posts. On Nazir's criticisms of 1Malaysia Development Bhd, Reezal said this was not unusual given the democracy practiced in Malaysia. "Even though he is the brother of the prime minister and news (on 1MDB) should be verified first, I tell you this is not unusual, we are in a democratic country that upholds democracy as a main principle, I see no qualm in that." He said if the Asia Sentinal report was true, it would impact the country's political landscape. But he added that it was an interesting evolution in politics, and the government had no right to prevent anyone from forming a party. "Regardless whatever happens, it's interesting to witness new politics in Malaysia. Democracy is now at the testing ground for the next level of maturity," said Reezal. 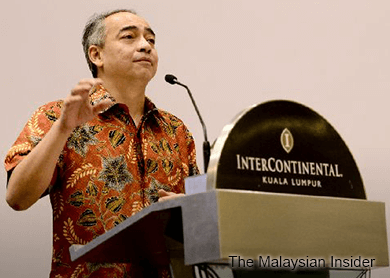 Asia Sentinal reported that Nazir, who is the chairman of CIMB Group, is in the midst of forming a new non-partisan political party to reach out to all races.